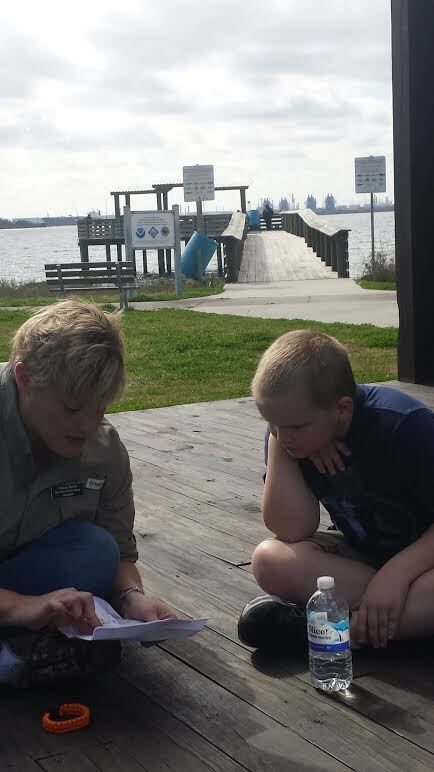 This past Saturday, we drove an hour or so southeast to visit the Baytown Nature Center. Our geocaching friends were having a brief flash mob down there, hosted by “Baytown Bert”, and we were curious about the two hour wilderness survival course hosted by the park (free with the $3 entry fee) afterwards. Despite the unpredictable nature of the weather the past month, it ended up being a beautiful morning to spend outside. I had been to this center once before, but Jason hadn’t, and we enjoyed exploring it with the kids. 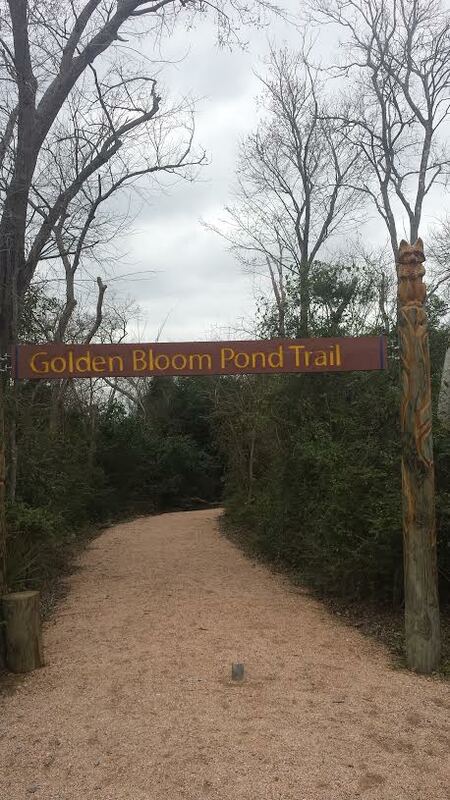 The center boasts 450 acres of wetlands, hiking and biking trails, and is an official site on the Gulf Coast Birding Trail. Some 200-300 species of birds visit the park during the year. 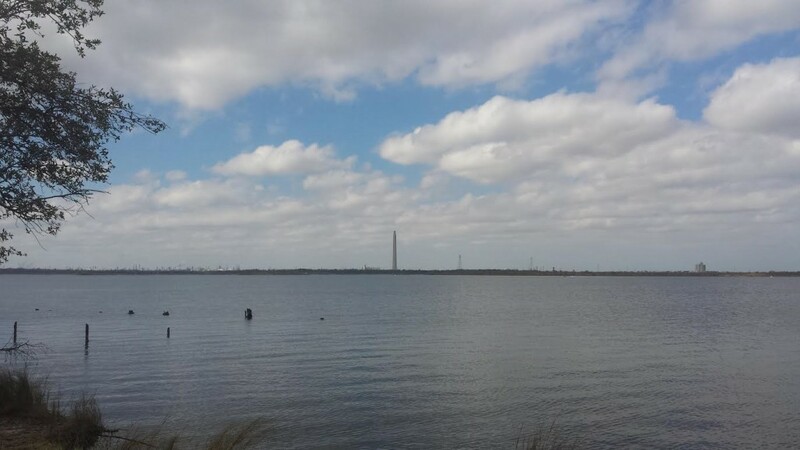 It is surrounded by three different bays, and within site of refineries and a well-known memorial of Texas Independence (see below pic). Can you guess what memorial that is? After greeting our friends, my youngest went off to play on the playground, which was surprisingly appealing in its nature theme. After this, he became engrossed in the survival class, led by Chrissie (spelling? ), an employee of the park. She engaged the class in exploring different uses for common items found in hiking packs. After going through safety advice and suggestions at how to use these items in her pack, she broke the class up into small groups and presented them with an imaginary scenario in which they had to figure out how to survive with a specific list of items. She had Kaleb in her group, and he was coming up with some good answers to her questions. I thought it was so cute how into this class my eight year old was, but the older guys in our group were cold and ready to move on with our day, so I had to pull the youngest away from Chrissie and move him along to the next activity. After this, we stopped to find a handful of geocaches on the way out. On the way to the first one, we saw a beautiful Osprey perched out on a pole along the bay. He was particularly striking, with a splashy white and black face. At the next cache stop, near the butterfly garden, we saw him again flying majestically through the air above us, searching for prey. At another stop, as we looked out over the wetlands from a gazebo up on a hill, we heard him crying out, and then spotted him perched in a tree near the water. We also watched a Royal Tern dive into the water in the bay in a search for food that fascinated us for a while. I saw a Spotted Sandpiper bobbing by the water’s edge, its breast the solid white (no spots) that characterizes the winter plumage of this species. Brown Pelicans flew above the water, and cormorants shared pier posts with Laughing Gulls. We also observed brown headed cowbirds, common grackle, a Loggerhead Shrike, Great Blue Herons, Great Egrets, an d heard Red Winged Blackbirds. We ended up with six cache finds in the park on our way out, with several left on the map unfound for a future return trip. Lunch time hunger drove us out of the park, and we ended up stopping for greek food on the way home in downtown. All of us really enjoyed the park (although the teenager spent most of the time listening to his music on his earbuds and just tuning us all out, which is so typical of these years). 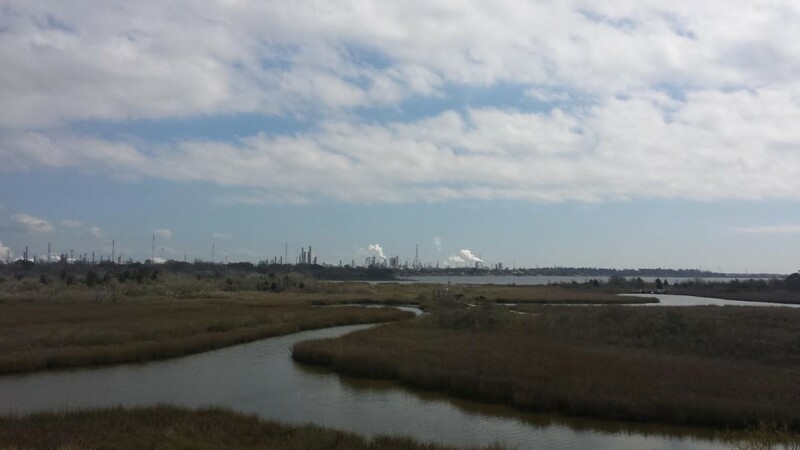 This park fascinated me with its juxtaposition of the natural beauty up against the backdrop of oil refineries in the distance. It reminded me a bit of how I used to think Houston was an ugly city, but I have actually learned to find the beauty in its natural places, and have gained appreciation of how both can exist over time. Like Houston itself, Baytown Nature Center is a place worth a deeper look.